The Forum Theatre opened on 18th December 1930 with Lupez Velez in “The Storm”. Also in the opening bill was a variety stage show starring Clapham & Dwyer with a 24 piece orchestra. The original seating capacity was 2,200 in stalls and circle. The style of decoration was Classical, with Romanesque touches and there was a large 80 feet wide coffered dome in the auditorium ceiling. The side-walls were decorated with pastoral Italian scenes. The stage was 30 feet deep and the proscenium was 45 feet wide. There were eight dressing rooms and the theatre was equipped with a Compton 3Manual/8Rank organ. The projection box was located in the rear of the orchestra stalls rather than the usual position at the rear of the circle. The Forum Theatre had a circular shaped tea room/cafe located above the main entrance. It was the first of three theatres to be designed for Herbert A. Yapp’s Wyanbee Theatres, a small circuit located in the north of London. The other two Forum Theatres at Kentish Town and Ealing were also designed by architect J. Stanley Beard for the circuit in 1934. The circuit was sold to Associated British Cinemas (ABC) on 8th April 1935. 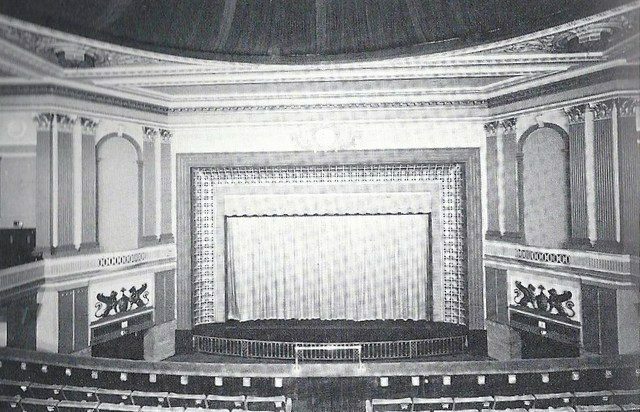 This cinema was re-named ABC in 1961 and during the 1960’s the Compton organ was removed. In June 1974 it was closed for conversion into a three-screen cinema (one in the circle, two in the stalls) and in early 1975 a fourth screen was added in an adjacent squash court that had been built on the theatre’s car park. In 1977 the circle screen was divided into two screens. In recent years a sixth screen opened above the former squash court screen. It has gone through several changes in ownership since the demise of ABC Cinemas and is currently operated by Cineworld. This cinema’s features include a beautiful exterior and lobby, along with a very courteous staff. Although all of the trappings of the original auditorium have been scrapped, you can still some of the balcony molding in auditoriums four and five and in the main entrance foyer. Seating capacities are for 348, 327 in the former circle and 173 in the upper area of the squash court, and 219, 204 in the former stalls and 155 in the lower area of the squash court. Meet us at MIPIM 2019!